If Republicans in Congress are able to enact new reductions to federal programs, that's exactly what food-stamp recipients will get. Elizabeth Webster wakes up every morning at 5:30 to get her two daughters ready for school. If there’s enough left of the $440 the family receives each month from the food-stamp program, her daughters have fruit or vegetables in their lunches. If not, well then, “you have to get creative with a hot plate,” she says. Her family has moved from a hotel to an apartment in Kenner, Louisiana. But like other four-person families, to receive food stamps their gross monthly income must be less than $2,498 ($29,976 a year), and they must have less than $2,000 in countable assets. So the prospect of cutbacks at the hands of Congress sends a shudder through the Websters’ future. Even if the cut is small -- $36 or so for them, under current plans -- it could leave them one step closer to the edge. She and her family are among the 47 million Americans -- and nearly 1 million in Louisiana -- who use the Supplemental Nutrition Assistance Program -- the official name for food stamps -- and who are facing the prospect of fewer resources as Congress debates just how much to pare the program back. The legislative path forward is murky. Historically a part of the farm bill, the food-stamp program was separated into its own piece of legislation by House Republicans, who are leading the effort to cut it back. Now, even as the Senate has appointed conferees, the farm bill -- minus food stamps -- awaits conference; its future, and SNAP’s, are both uncertain. What is certain, though, is that cutbacks are set to take effect regardless of Congress’s action on the farm bill and the food-stamp program. Temporary benefits as part of the economic stimulus enacted in 2009 expire on November 1. That amounts to a cut for an average family of nearly $30 a month, according to the Food Research and Action Center. For the Websters, the hit would be $36 a month, according to Mike Kantor, director of public affairs for the Second Harvest Food Bank of Greater New Orleans and Acadiana, where the family occasionally receives assistance. Put another way, if Elizabeth Webster uses only food stamps, she will be feeding her family on $3.37 per person each day after the cut. Americans’ use of the food-stamp program correlates strongly with the unemployment rate and the strength of the overall economy, according to Kantor, which explains why Congress temporarily increased benefits at the start of the Great Recession. But while the economy has recovered to a degree, more Americans are applying for SNAP benefits, designed to supplement what families spend on food each month. Kantor says the program is a significant source of food for many. The Webster family’s experience tracks with the national picture. Forced from their home after Hurricane Katrina, they moved to Alabama, where Elizabeth, 42, worked as a security guard and her husband, Kenny Robert, had a job driving a tow truck. But the BP oil spill left both unemployed, so they moved back to Louisiana and applied for food stamps for the first time, Elizabeth said. With the program’s help, her daughters Michelle, 17, and Denise, 15, ate fresh fruits and vegetables for snacks, and Elizabeth could make everyone’s favorites for dinner, albeit on a budget: spaghetti for Kenny Robert, roast for Michelle, and “anything you put on a plate” for Denise. Without the assistance, “we just learned how to eat hot dogs and biscuits and called them pigs-in-a-blanket,” she said. Whatever the legislative outcome, even more cuts to the program appear likely. The farm bill passed by the Democratic-controlled Senate includes about $4 billion in reductions to SNAP over 10 years. The original House farm bill, which included $20.5 billion in cuts to the program over 10 years, failed to clear the chamber in June when conservative Republicans and Democrats blocked its passage. In July, House Republicans decoupled SNAP from the rest of the farm bill. 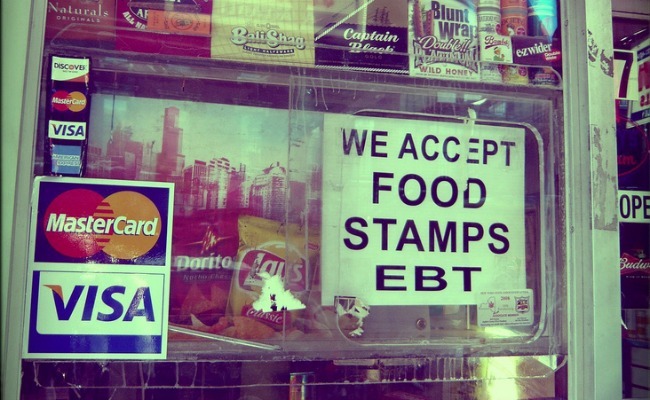 Now, led by Majority Leader Eric Cantor, they are working on a food-stamp provision that could cut as much as $40 billion over 10 years, according to reports. Legislative language for the Cantor proposal is not yet available. The conservative case goes like this: The food-stamp program is abused by recipients who are not meeting eligibility requirements. In particular, conservatives want to tighten loopholes that they contend allow able-bodied adults without dependents to receive assistance; they want to limit coverage for the able-bodied adults to three months within a 36-month period. “Currently, working middle-class families struggling to make ends meet themselves are footing a bill for a program that has gone well beyond the safety net for children, seniors, the disabled, and families who desperately need the assistance,” said Cantor spokesman Rory Cooper. Antihunger advocates say House Republicans’ proposed cuts would hit some of the neediest Americans hard, and they argue that the law already contains adequate restrictions against abuse. At the Capital Area Food Bank, a 100,000-square-foot warehouse facility -- a kind of Sam’s Club for food pantries in the metro Washington area -- officials say food-stamp funds typically last recipients two and a half weeks. After the benefits run out, many go to food pantries to help make ends meet, according to the Food Bank’s Brian Banks. Conservatives, meanwhile, argue that food-stamp funding has been rising too quickly. The program cost about $78.4 billion to help feed roughly 47 million participants in 2012, according to the Agriculture Department. That’s up from about $17 billion from 2000, when 17 million Americans participated. “The national debt has now topped $16 trillion and will continue to grow rapidly for the foreseeable future. To preserve the economy, government spending, including welfare spending, must be put on a more prudent course,” wrote the Heritage Foundation’s Robert Rector and Katherine Bradley in a white paper. Anti-hunger advocates, though, point to a spike in the number of Americans who are “food insecure,” a term used by the government, that correlates to the recession. According to USDA, the number has recently stayed at roughly 15 percent, with 17.6 million households classified as such in 2012, according to a newly released report. With 59 percent of food-insecure households using food stamps, advocates argue that it’s important not to slash SNAP. Now that Congress has returned, the farm bill and the food-stamp program will compete for scarce legislative time with the situation in Syria, appropriations bills, and a debate over the debt-ceiling limit, which the government is expected to reach sometime this fall. Among antihunger organizations, optimism is in short supply. Food Research and Action Center President Jim Weill puts the odds at “12 percent” that the House will pass a bill, but he predicts that it won’t make it out of conference with the Senate. Senate Democrats, though, are optimistic they will be able to stave off the steep cuts that Cantor is expected to propose. They point to the 18 Republicans who voted with Democrats on final passage of the Senate’s farm bill. “So many in both parties want to pass a farm bill that reforms programs, ends unnecessary subsidies, reduces the deficit, and helps creates American agriculture jobs,” said Cullen Schwarz, a spokesman for Senate Agriculture Committee Chairwoman Debbie Stabenow, D-Mich.